When it comes time to invest in a sewing machine, the options (and price ranges) available can be daunting. Whether you’re looking to replace a beloved sewing machine that has gone over the quilted rainbow in the sky, or want to start out on your own quilting adventures for the first time, investing in a sewing machine can be an important part of your crafting journey, but it shouldn’t have to break your bank. Depending on the extravagance you’re looking for in your quilting sewing machine, there is a wide range of specialized sewing machines available with a wider degree of price points. For our search, we’ve rounded up the most generally useful quilting sewing machines at a reasonable price point that won’t leave your wallet feeling like it could use some new stuffing of its own. You want to look for a quilting machine with a longer arm option, and plenty of stitch and foot options to choose from. The more options available, the higher the price point in many cases. However, you don’t have to cut on quality to get a sewing machine within your price range. All of our below options take advantage of the many different stitches available in modern machines. Many sewing machines also offer adjustable arms and bases, as well as many different stitch feet for you to work with. We’ve gone for the best base sewing machines for quilting available, but have counted most long arms out of our search, since these can run on the pricy end. However, check out our article on Best Mid and Long Arm Quilting Machines to find out why a long arm quilting sewing machine can change the way you quilt for the best. No matter what quilting project you have in mind, finding the right sewing machine for your project is a great way to ensure your next quilt comes out looking like a million bucks, without spending a million on your quilting machine, of course. Without further explanation and ado, here are the best sewing machines for quilting under $500. This sewing machine falls into the realm of pay more for more features. Not only is the Janome 2030QDC-B Computerized Quilting and Sewing Machine with Bonus Quilt Kit equipped with computerized stitch selectors, but it also comes with a bonus quilting kit, and boasts a 7 mm stitch width. It’s LCD display and one-handed needle threader are a bonus for anyone who has spent far too long trying to thread a finicky needle on the go. What makes it a good option for quilters is its extendable table, allowing you to transition from a traditional sewing machine to a quasi-long arm machine in seconds. And it’s lightweight design makes it easy to carry around, making it perfect for traveling. However, as pointed out by one Amazon reviewer, the machine can suffer from “tension issues and the auto threader would stick to the needle and break the thread.” While this sewing machine deserves a spot on the list due to its large number of features and convenience, it sits securely at the number 5 spot. The Janome New Home 2030QDC-B showcases the amazing quality you associate with Janome heritage. It contains a variety of features normally found only on more expensive models, including 7mm stitch width, LCD display with easy navigation, and a one-hand needle threader. The machine offers 30 built-in stitches and 3 one-step buttonholes. Easy convenience features include a start/stop button, speed control slider, auto lock button, memorized needle up/down, and easy reverse. It is lightweight for easy portability at just 12 pounds. 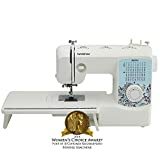 Ringing in at under $200, this machine is a must-have for anyone who is looking to branch into the world of quilting without giving up some of the catch-all features of a basic sewing machine. 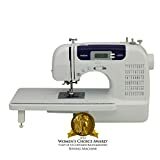 The built-in stitch variety is a huge selling point, as one Amazon review points out, noting there are“plenty of stitches to keep me happy when creativity strikes.” While not specifically set up for quilting, the wide table does avoid the short arm space pitfall of many basic sewing machines, all at an incredible price. 185 stitches to choose from, a backlit LCD display, and variable speed control, all wrapped into one sewing machine for the quilter working on a budget. As pointed out by one of the 153 5-star reviews boasted by this project, ‘I would recommend this machine to anyone.” The additional sewer base attachment comes with a built-in measuring tape for easy measurements while stitching, helping you to keep your quilt tidy every step of the way. This machine makes the top of our list of Best Sewing Machines for Quilting Under $500 due to its incredible stitch count, autopilot mode, and bonus accessory kit, not to mention the extension table that makes it a quilting must-have. With 600 stitches to choose from and an autopilot mode to make larger quilt projects a snap, we find ourselves agreeing with one 5-star reviewer who wrote that “it was fast to learn & pick up sewing while using this machine.” Whether you’re a beginner quilter looking to tack your first batting, or a tried-and-true quilter looking to expand their collection, you’ll be far from disappointed with the SINGER | Quantum Stylist 9960 Computerized Portable Sewing Machine.